With a wall painting stencil, you can create unique works of art, even if you don't consider yourself artistic. That’s the beauty of using Stencils for Painting. You don’t have to be a DaVinci to create art. Stencils help you put an image on a wall (or anything) and from there you can add your own touches. Stenciling is a traditional decorative painting technique and it’s perfectly easy to learn, too. If you can handle a paint brush and a tape measure, you can quickly master the techniques for applying an attractive, simple border. And with a little practice, you can tackle complex patterns using multiple stencils and colors— and even create your own designs. This photo is courtesy of Royal Design Studio where you can find this unique design. The key tools for a wall painting stencil project are a stenciling brush, the stencil and paint. When you get to the bottom of the page we have a few suggestions on suppliers for these items. And don’t forget to visit The Stencils Store. For a more detailed discussion on the supplies needed for your wall painting stencil project please refer to our Stencil Supplies Article. Here’s how it’s done in words (but if you want to see it in action, scroll down for a great video – I think seeing is the best way to learn – I hope you do too!). Position your stencil on the wall at the desired height and mark the alignment holes or top edge. (If you need to know more about using alignment holes go to our discussion on Stencil Patterns). Then snap a light, horizontal chalk line around the room at that height. Make sure that whatever you use wipes off easily. Or use faint pencil marks, which can be easily erased or painted over later. The key to a good wall painting stencil layout is to avoid awkward pattern breaks at doors, windows and corners. To work out the best spacing, measure the stencil pattern and mark the actual repetitions on the wall. Vary the spacing slightly as needed to make the pattern fall in a pleasing way. Or if your stencil has multiple figures, you can alter the spacing between them. Start your layout at the most prominent part of the room and make compromises in less visible areas. Draw vertical lines at the pattern center points to make positioning easier. Tape the stencil pattern where it lines up with the alignment marks and put a small quantity of paint on a paper plate. Push the stenciling brush into the paint just enough to coat the tips of the bristles, then pat off the excess on a dry cloth or paper towel (I usually use the empty space on my palette or paper plate), making sure the paint spreads to all the bristles. The brush should be almost dry— remember it’s easier to add paint than it is to take it away. Pssst! 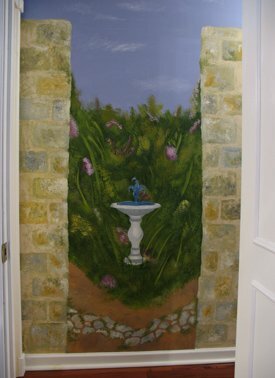 If you're thinking about painting a mural like this one you should know it's easy with stencils. Just go to Stencil Wall Murals to get all the details that will guide you through the entire process from painting the background to lining up the wall painting stencils. I know it's hard to imagine how to conquer a project like Mural Stenciling just by reading the words so I created a video for you to follow along with me in person. If you need more information on stenciling techniques, please visit our page on How To Stencil for everything from the basics to advanced tips and hints. Mistakes are easy to correct. You can lift the stencil and wipe off any paint that smeared under the edge with a damp paper towel, or touch it up later with wall paint. If you wipe some of the stenciled area away, just lay the stencil down again and touch up. For more ways to touch up, go to Stenciling Techniques. I bet you’re like me and when you get an idea you want to jump on it right away while those creative juices are flowing. Well, if you’re ready to get your wall painting stencil project started now then don't miss these Wall Stencils to Download. It's instant gratification! Let's say you wanted to create a whole wall with a brick pattern like the walls that outline the mural above. Well, using a Stencil Stone Wall is the best way to do that and you'll find tips on how to make it look real too. 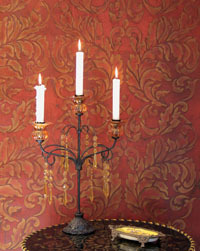 Royal Design Studio has a beautiful line of decorative wall stencils. You'll even love the web site. It's packed with great how to information and inspiration rooms that have been transformed with stencils. But it doesn't stop there. They also carry many of the supplies that you will need. Hey! Don’t forget that I (and everyone else) want to see what you have done with your wall painting stencil project. Just click on Stenciling Projects to get your masterpiece showcased here on this web site. Won’t that be exciting! Or if you have any questions or want to share information join in on the Stencil Blog. Well, I hope to hear from you soon. P.S. We are thrilled to introduce our selection of downloadable Stencil Designs in The Stencil Store. Instant gratification at its finest! You don't need a special printer - these designs are specially formatted to print straight from your home computer on standard letter sized paper. Once downloaded, you will have your complete stencil booklet with patterns and instructions. Just click, buy and print! Return to Home Page from Wall Painting Stencil. Return to Wall Stencils from Wall Painting Stencil.